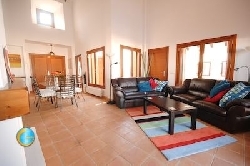 Villa Mendes is a bright and contemporary 3 bedroom Moroccan style villa which sleeps 6/8 people, with a private sunny south easterly garden enjoying the sun for most of the day. It is ideal for family and friends to enjoy a relaxing and/or active break. There are typical mountain views of the Sierra del Carrascoy Mountains from our private rear garden. The villa comes with full air conditioning in all rooms for the summer and central heating for the winter months. The garden is fully equipped with patio furniture and sun loungers (8 garden chairs and 4 sun loungers with cushions) by the pool and terraces - both open and covered give ample space for everyone. The built-in BBQ is located under the roofed terrace between the kitchen and the pool, and the 2 dining areas provide a fantastic opportunity to enjoy �alfresco� dining for most of the year. There is parking space for three cars on the drive to the front of the villa. Is large, bright and spacious with a beautiful vaulted ceiling. This is furnished for up to 8 people, with leather sofas, chairs and cushions. There is a large flat screen TV and DVD with internet access (need laptop, telephone connector and internet card which is available from many locations in the resort). There are 30+ TV channels including all the popular UK programs and radio channels, your own CDs can be played through the TV. A collection of DVD movies, books and games have been left for you to use during your stay in the villa. A large dining table also provides ample space for the cooler days when you might want to enjoy a meal inside, maybe Christmas dinner! Is fully equipped for all your culinary needs, whether you prepare gourmet meals, BBQs or something easy. All the equipment is to a very high standard (Bosch) including a full oven and hob, kettle, toaster, dishwasher, microwave and American style fridge/freezer providing ample space for food storage as well as a cold water-ice dispenser on demand. The three bedrooms are comfortably furnished with the main bedroom having ensuite facilities and a king size bed. The further 2 bedrooms have 2 single beds in each. Built in wardrobes and bedside cabinets provide ample storage for all your holiday needs. All bedrooms have air conditioning and a central heating radiator for the winter months. Two spare pull out beds and a baby cot and highchair are available, but you would need to provide the cot linen. The ensuite bathroom has twin wash basins, Jacuzzi bath with shower, toilet and bidet. The shower room has a large screened shower, washbasin, toilet and bidet. A hairdryer is provided. provides you with a washing machine, an ironing board and iron and somewhere to clean your golf shoes or hang your beach/pool wear at the end of the day. The villa is all on one level allowing easy access for small children. Wheelchair users need to be aware that there are two wide steps to the front door. El Valle resort and its luxurious villas and apartments are a wonderful place to holiday with family and friends. The most peaceful and exclusive of the Polaris resorts all offering top class golf. The resort has a restaurant, bar with a large outdoor eating patio overlooking the course. There is a supermarket, gym, tennis, paddle tennis, and cycling circuit.